Examine the attributes most critical for today’s real-time analysis from the factory floor. What factory floor secrets are you missing? There’s an entire treasure trove of critical information but it’s often hidden within complex systems, automation and stand-alone reports. 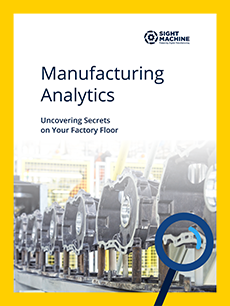 A can’t-miss white paper from Sight Machine shows that with more intelligent use of factory data, today’s manufacturer can uncover hidden secrets from the factory floor – and gain a better competitive position. real time visibility into your systems and operations. analysis of existing factory automation systems. the manufacturing intelligence you need to run your enterprise. Operational insight is often masked by mountains of process and part data flowing from factory floor sensors, automation systems, machines and other data sources. In other words, factory floor data holds “secrets” concealed in correlations, trends, anomalies/deviations, root causes, and other key operational information that is difficult to gather and analyze. This lack of insight leads to lower quality rates, production inefficiencies, and lack of trust in the data that’s available. Fill out the form to download Sight Machine’s white paper.